Apart from the short delay at the Hungarian-Austrian border, courtesy of our South African friend, everything seemed to be going to plan and we calculated that with the extra fuel (48 gallons) which we were now carrying we would get to Skofja Loka without having to buy any more, how wrong we were! At the first hill we came to approaching the Austrian border, our faithful Ford Thames began to protest quite violently at the quality of the fuel. To be more precise the engine started to ‘pink’ (pre-ignition). Once over the border we had no alternative but to buy more fuel of a better quality. After some experimentation we found that if we mixed 1 gallon of Hungarian petrol with 2 gallons of Austrian petrol we could motor along without any further protest from the engine, this we thought had solved our fuel problems, wrong again! Approximately half way to Skofja Loka we became aware of a smell of petrol and on examination discovered some of the 6 gallon tanks, but not all, were beginning to leak at their seams! We quickly repositioned the tanks so that the leaking seams were uppermost and as far away as was possible from the van exhaust. With windows now wide open and always parking well away from any other vehicles we, rather foolishly perhaps, continued on our way hoping we would be able to use up all of our cheap fuel before any further calamities befell us. “Lady Luck” was clearly still on our side and we arrived at Skofja Loka on the 20th May without any further problems (but minus only 3 of the leaking Hungarian fuel tanks!). Skofja Loka is an ancient, attractive, town in the heart of Slovenia; a spectacular mountainous and heavily forested country with many lakes. Slovenia is easily the scenic equal of Switzerland, Austria or the English Lake district. Driving into a square at the centre of the town we were soon directed to the Town Hall. Here we met a most helpful lady who explained our options regarding accommodation whilst we were in Skofja Loka. Having been somewhat spoilt in Budapest, and having established that we could pay the bill in the local currency, we opted to stay at the only hotel in town rather than at the free camp site situated outside of town close to the circuit. For reasons I cannot now quite remember, we assumed the race meeting at Skofja Loka would be a relatively small International meeting. This seemed to be borne out when checking into the hotel. We found we were the only competitors to have booked accommodation there. After dinner, we went sight seeing and again everything seemed very quiet in the town. We began to wonder just how few foreign International riders were going to turn up for the races. What a surprise we had when arriving at the circuit the following morning. The paddock was full of International riders and mechanics from 16 countries — none of whom were staying at our hotel as unbeknown to us the Yugoslavian authorities had earlier announced they would allow the conversion of their currency, within certain limits, to hard currencies at the borders for foreign visitors when leaving Yugoslavia – I am still glad we opted to stay at the hotel for reasons which will soon become obvious! 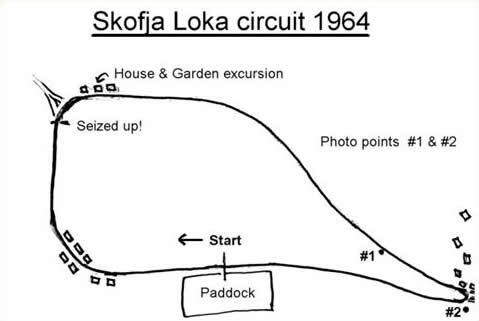 The Skofja Loka circuit, again on closed public roads, was a little longer but similar in shape to Mallory Park with the exception that the hairpin bend was even tighter than at Mallory and consisted of a steep rise at the entry and up to halfway around the bend! 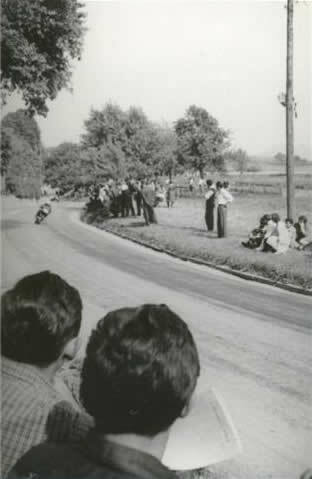 — this caused havoc in both practice & the races as many of the riders did not have a low enough bottom gear to get through this hairpin even when slipping the clutch. In one case I saw an AJS 7R rider jump off and push his bike around the apex of the bend – and he did not lose much ground on the other competitors! Fortunately, as it was to prove, my 125, 250 and 256cc Parillas had ideal bottom gear ratios for starting and navigating this hairpin bend. 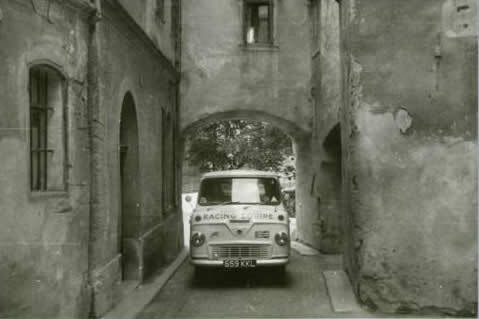 Having driven around the circuit at least a dozen times in the Thames van before the start of practice I felt confident the Parillas would go well at Skofja Loka. Most of the bends, in addition to the notorious hairpin, were tight enough to slow down the more powerful bikes (particularly the 350cc machines) and the straights were short enough to prevent them from over exploiting any power advantage they had over my Parillas. Practice went well for me in all classes being timed at 10th, 6th and 12th respectively in the 125, 250 and 350cc classes during the first timed practice session. Trying to get a little more power from the Parillas we decreased the size of the main jets and lowered the carburettor needles one notch for the final practice sessions the following day — this was to turn out to be a big mistake! That evening, returning to the hotel, we heard English voices at the reception. They turned out to from Raymond and Bert from Stockport, UK. They had been staying at our hotel for several weeks whilst installing new textile machinery, supplied by their employer back in the UK, into a factory close by the race circuit. They had been watching the practice session that day and we soon got into conversation before joining them for drinks and dinner at the hotel. Our meeting up with them resulted in us passing on 2 mechanics passes so they could join us the following day and for the rest of the races. In the morning we discovered that the changes we had made to carburation the previous day helped to improve pickup (acceleration) on the 125 and we also gained an extra 200 – 300 RPM in top gear. This helped me to advance my position on the starting grid during my second practice lap from 10th to 7th when disaster struck — the engine seized! This happened after I had gone through the double bend at the end of the start and finishing straight and just as I was changing down a gear to take the next right-hand bend. Having already started to lean into the oncoming right-hand bend the engine seizure momentarily locked the rear wheel before I could get the clutch in. This sent me, still on the bike, sliding towards the front gardens of a small group of houses positioned right next to the track, fortunately for me and the owner of the front garden gate, it was open! My speed was now down from about 70 to 10 MPH. When seeing the next obstacle coming up was the front door of the house I panicked, applied too much rear brake, and fell with the bike on top of me into a large flower bed. I do not know who was more surprised, myself or the owner of the house who had been sitting on his front wall watching all these events unfold and finally the attempted destruction of his flower bed! The race organisers sent a truck to collect my 125 which fortunately was not in too bad a state. I was not quite so lucky being bruised all over and having sprained my left wrist and right ankle – I was in no shape to attempt further practice that day and my earlier lap times had to stand. This meant I was relegated further back down the starting grid in each class as the other riders continued to improve their lap times. This was to be my first, and fortunately only, crash in 1964. I could not but kick myself, as I was taken to the First Aid Centre and then back to the Hotel, for having been so greedy in seeking more power from the engines when I already had enough to gain (with any luck) top 10 places in each class. The poor quality of the fuel did not help but I was already aware of this danger — my last thoughts as I went to bed that night were ‘what a plonker’. After seeing that I was generally ok back at the hotel Vic returned to the paddock with Bert and Raymond where they worked late into the night rebuilding the 125 and rejetting the 250 and 256cc Parillas back to their previous settings! This was, of course, a major problem for the race organisers who now had some of their best known competitors locked up and a race meeting to run. After many frantic telephone calls between the Mayors office in Skofja Loka and the Authorities in Ljubijana it was agreed they would all be released subject to surrendering their passports. Approximately 3 hours later, after seeing a rather distressed Claire Molloy (Ginger’s wife) and one of the organisers rushing around collecting the now branded delinquents passports, they all turned up looking rather sheepish but otherwise non the worse for their experience in police custody — all this before the racing had even started! At last the first race of the day started, from the back of the pack I rapidly began to make up places on my 125 Parilla. It is amazing how quickly you forget any injuries you may have once you get into a race — particularly if you are picking off the opposition one by one. Keeping one hand on the clutch lever for the whole race, and hoping the engine would not seize again, I was relieved and delighted when I crossed the finishing line and later discovered I had finished in 6th place — the best position I had achieved on a Parilla so far. 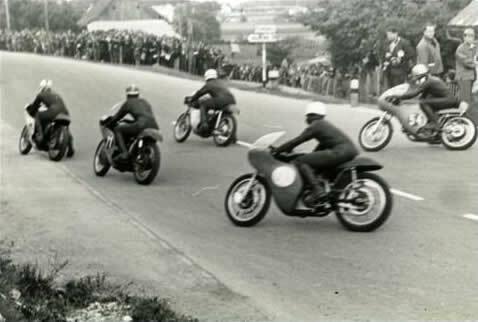 The race was won by Ulf Svensson followed by Manfred Magnus & Peter Eser – all riding 125 cc Hondas. One reason I will always remember this race is that for the very first time I was racing up against Tim Lake from Esher Surrey. I had been introduced to Tim, back in the Winter of 1962 or 63 by John Bacon, another motorcycle racer and my mentor for many years. We had spent a number of evenings at Tim’s home listening to him describing his experiences and the ‘Do’s and Donts’ of racing on the Continent. I will always be grateful for his sound advice which may have helped me stay ahead of him on his MV in the 125cc race at Skofja Loka. Tim did encounter some gearbox problems during the race which may account for my being able to beat him. From the 3rd or 4th row of the grid in the 250cc race I had a flying start & was up behind the leading group of riders which included the two New Zealander’s Ginger Molloy and Morrie Lowe on very quick Bultacos, Ulf Svensson (Bultaco? ), Rudi Thalhammer on an Aermacchi, a Benelli & two MZs. This was racing for real and I soon forgot (or ignored) all Tim’s advice (to only ride at 95% of ones ability) swapping places at almost every corner. This was the closest racing I had been in on a 250 up to this time and I enjoyed every minute of it. Half way through the race one of the MZs dropped out shortly followed by the Benelli then 2 or 3 laps before the finish Ginger dropped out with an engine seizure and Morrie disappeared as well. This all made it a little easier for me to take third place behind the winner Svensson and Thalhammer in second — my first podium finish in an International event! What a day to remember and also the celebrations which went on well into the night and the following morning! Again we had another two week gap before our next scheduled race in Albi, close to Toulouse, in France. We therefore, decided to extend our stay at Skofja Loka for two days so that we could do some sightseeing & take a short break. I was certainly in need of R&R after the celebrations and my earlier encounter with the flower bed! The Hotel in which we had been staying was fully booked for the week following the races so we accepted the kind offer to stay for two nights with the family of the Lady who had first welcomed us in the race control office at the town hall on our arrival at Skofja Loka – this proved to be a very good move in that it was not only interesting to be staying with a Slovenian family but the family included a young teenage daughter who spoke some English and an even younger son, both very keen to show us around town and the surrounding countryside. We were to visit Skofja Loka and stay with the same family again later in the year. Some years later I was fortunate and very pleased, to be in a position to assist their daughter in obtaining a UK entry visa when my wife and I acted as her guarantors whilst she completed a nursing training program at a London Teaching Hospital.